This memorial website was created in memory of our loved one, Hazel A. Mcisaac , 79, born on April 17, 1933 and passed away on December 14, 2012. 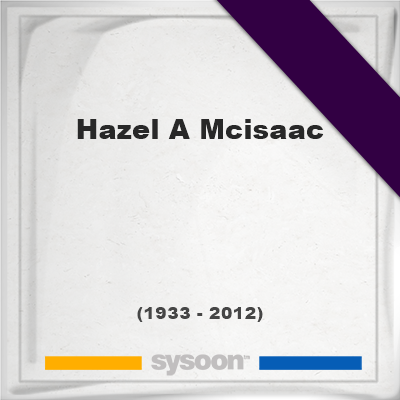 Where Hazel A. Mcisaac is buried? Locate the grave of Hazel A. Mcisaac . How Hazel A. Mcisaac died? How to find family and friends of Hazel A. Mcisaac ? What can I do for Hazel A. Mcisaac ? She was a politician in Newfoundland and Labrador. McIsaac represented the District of St. George's for the Liberal Party in period from 1975 to 1979. Later was active in municipal politics in the Town of St. George's. Mclsaac had two children Byron and Sophie. She passed away peacefully at the Bay St.George Long Term Care on December 14, 2012. Note: Do you have a family photo of Hazel A. Mcisaac ? Consider uploading your photo of Hazel A. Mcisaac so that your pictures are included in Hazel A. Mcisaac 's genealogy, family trees & family history records. Sysoon enables anyone to create a free online tribute for a much loved relative or friend who has passed away. Address and location of Hazel A. Mcisaac which have been published. Click on the address to view a map. Hazel A. Mcisaac was born in Robinsons, Canada. Hazel A. Mcisaac died in Canada. Memorial of John Richard Moore, Jr.
Memorial of James Edward Proctor, Jr.